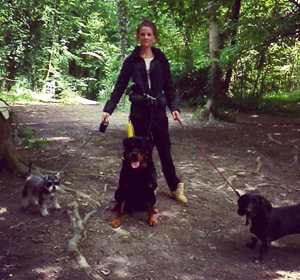 Hello, my name is Laura Regan and I have many years of experience in dog behaviour and obedience training, as well as tracking and scent work, using positive and motivational techniques. I am a full member of the Institute of Modern Dog Trainers (IMDT). I have regularly volunteered my services at Stokenchurch Dog Rescue and assisted them with the handling and walking of their more challenging residents. I also have over 25 years’ experience within the equine world, completing my BHS stages 1-3 and competing my own horse at an affiliated level. I love working with animals and am very focussed on their welfare. When I look after your pets I give them the best possible care and strive to ensure they enjoy a positive and happy experience. Most of my clients have found me through word of mouth and referral from others.